Congratulations to those who were positive !! It seems we did reach an important bottom when we posted this a week ago !! The triple bottom is in, now is the time to take positions, but which projects to invest in first? There are a lot of quality projects out there in the blockchain space, but even more projects that will never come to fruition, not because they are scams (those also exist of course), but because it is damn difficult to turn a good idea into a great business. My approach is to look at a number of aspects, first of all the sector in which the project is active. The goal is to have exposure to a number of major sectors, including FinTech, Supply Chain Management, Real Estate, Storage and Document Management etc. It contains all the information you need to make informed decisions, has a very user-friendly interface and is comprehensive while not overwhelming you with information. Just have a look and let me know what you think, all suggestions are welcome ! no technical analysis work in BITCOIN. I agree that traditional technical analyses are not fully applicable to BTC, but all markets behave according to certain 'Universal/Fibonacci' rules since all markets are ultimately ruled by a combination of human psychology (short term) and fundamentals (long term). So it's good to keep an eye on short term technicals, especially if you are a trader, but fundamentals will always out way sentiment in the long term. I Belive there is no harm in investing that amount which you can afford to lose..In my opinion any one having knowledge of investing should have their 10 percent of investment in high risk assets which can give high returns as well..bitcoin is one of them. I agree, the only difficulty is, what constitutes a high risk investment? I personally think that Bitcoin is less risky than Tesla for instance or even Deutsche bank just to give an example. You could be right guys, but I still feel we have reached a bottom from which the next leg up will start. If I'm wrong it will only be a matter of time before we start the next and most impressive phase in the blockchain cycle, with mass adoption of applications. It is always a good strategy to build up positions when everyone else is selling or sitting on the sidelines, that is the case in any market with potential, and this one has huge potential ! how much do you think one should invest to retire in 5 years. i have been considering something similar but i have a 10 year investment plan to be on the safe side my figure is $20k atleast in current market when btc is hovering about 6000 3-4 btc is what i think is enough to invest now in alt coins and let it sit there for 10 years. In 2017 I multiplied my initial investment with a factor of 100 (mainly because of my positions in Ripple and Ethereum), but those were exceptional times. I think that with a meticulous selection of coins one can achieve times 10 in 3-5 years. That is the reason I am using the same method as I did to select Ripple and Ethereum at the time. With a couple of other crypto-enthusiasts we started a website based on this methodology. i love the thought of the triple bottom being the turnaround point, and for all we know it could well be. 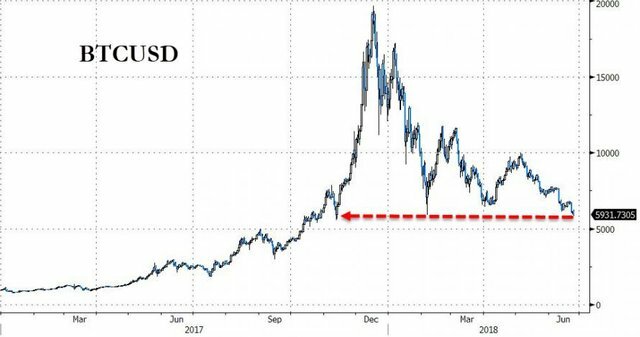 if not, i have one analysis that i haven't seen anyone else cover which i believe could be the absolute bottom if the triple bottom doesn't hold. 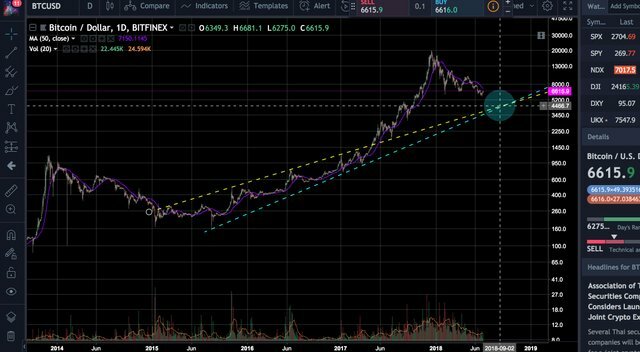 there is a long term trendline dating back to the beginning of 2015 (seen as the yellow line in the pic). this trendline proved to act as resistance about 9 times before breaking through finally and on July 15, 2017 the trend line acted as support for the first and only time yet. we could possibly be going down to test that trendline as support once again before the next bull market begins. this would put us at around 4300-4500 btc in august or september depending on how good this July bull rally lasts. please let me know what you think of this guys. do you think this scenario is possible? if you think my analysis is interesting, please follow me and subscribe to me on YouTube and Twitter too. You can find me as Crypto Galaxy X. thanks and may the bitcoin be with you! Following you, also on Twitter ! i'm holding my current positions even if July proves to be a big bull run. if we do find our way back to that trendline, you better believe, what fiat i have is going on a buying spree! alts will be incredibly cheap at the 4500 level, so cheap in fact that $500 in the right crypto would yield 100k easy when btc finally runs to even 15k. either way, i don't mind. In my opinion volume is very less as compare to previous week.. I also mentioned this in my previous post.. The website you suggest (www.topcoinrating.com) is really great, I've never seen such a straightforward interface ! Thanks for sharing ! Yes good information about cryptos what do you think when the bullrun comes what is your expectations? I am very much interested in Fintech (Ripple, Stellar...) and Supply Chain Management applications (Vchain, Modum, Ambrosus...), seem like good places for blockchain technology to provide added value. But also Civic, Golem, Walton, Hive and Elixir for instance to name a few less well known projects. I love your positivity.. we need more of this if we want to get to higher numbers.. thank you! Hello, ReSteem Bot at your service. If you upvote this comment, I will follow you back and ReSteem your most recent post. I will also follow you and upvote your posts randomly. @stevenmaiso, Do you think BTC will be crossing its ATH this year? If I look at the adoption curve for BTC with for instance the number of ATMs being installed (the first one in South Africa was installed only a few days ago) as well as official recognition, with for instance here in Zug where you can pay taxes or even train tickets with BTC, to this all point to BTC becoming an everyday reality for a lot of people, on top of being a very reliable store of value. Therefore I wouldn't be surprised if BTC would reach a new ATH by the end of this year. However, the timing itself is less important, just take your positions, sit back and you'll be a very happy camper in a few years time ! You explained to me very well. Thank you for replying to me Sir. I will always look forward for your post. Please have a look at this website and let me know what you think. I contributed to it from a conceptual perspective and did most of the technical writing. Hello Sir, I have gone through the website. Read some of the topics and I really feel it be informative. Very much quality content. Try to include more coins in it. And really very nice interface. I am sharing it. Thank you for the kind feedback and for sharing, much appreciated ! It is indeed the intention to add many more coins, but still keep it manageable when it comes to regularly updating all of them. Yesterday we received positive feedback from a large project in China telling us that the rating had helped them identify gaps in their communication, so it's good to hear that this kind of analyses can benefit blockchain start-ups as well. Awesome, keep up the good work and also please help me grow too sir. Thank you and my support will always be with you. you have any idea which project goes good in future...? The link to the website should give some guidance on that, it's a sector-based analysis of what should be promising !